By Nadezda Azhgikhina, vice president of the European Federation of Journalists and board member of the Free Word Association. Elena Nadtoka and her lawyers, Galina Arapova of the Mass Media Defense Centre and criminal lawyer Tumas Mikasyan, had waited six years for the vindication provided by that Supreme Court judgement. It was not by any means the only important legal victory for the Russian media thanks to the Strasbourg court. Applicants in several previous cases had also won and been awarded compensation from Russian state. But Elena Nadtoka, who had been convicted of ‘damage to reputation’ and defamation of a local official who was criticized in her newspaper, brought a case demanding not only compensation but the overturning of all the rulings against her in the Russian domestic courts. Nobody had achieved that before. The outcome was greeted with jubilation by the media community. Experts considered that it offered hope to many others who have brought similar cases and could significantly improve the chances of achieving justice. At the same time, the case highlighted the dramatic contrast between the few shining examples of victories for the rule of law and the everyday situation for free and independent media in Russia, which has grown more and more severe for independent voices and media enterprises. The first modern media laws were enacted in Russia in the early 1990s. Based largely on European norms they established a legal basis for the activities of news media for the first time. But those provisions for protecting press freedom and independence have been repeatedly challenged from the start. Attempts to restrict or stifle news gathering and reporting activities began almost as soon as the law was passed. Since then media experts have counted more than 25 amendments, special recommendations and other legal initiatives related to media activities, all demanding new restrictions of various kinds for journalists and independent media. An array of severe restrictions came into force, and legal protections were also removed, when many of those amendments were incorporated into the law and enacted in 2014. At the same time media lawyers have recorded a wave of lawsuits against independent or critical journalists, bringing often massive pressure on journalists and editors in the courts. Until five years ago most of those legal actions were brought by business figures and state officials seeking convictions and damages for defamation, damage to reputation and privacy. Today the great majority of legal actions come from state agencies and regulators, alleging violations of this or that regulation. Prominent among them are cases brought under Russia’s sweeping “anti-extremism law” which followed several much-publicized terrorist attacks in Moscow and other parts of Russia, and the start of the so-called ‘war on terror’. The definition of “extremism” in the new law is so broad and ill-defined that the law quickly became a tool to punish all sorts of critical voices. Dozens of media all over Russia have been taken to court for “promoting hostility to certain groups of people”, among them local police forces, allegedly corrupt local, regional officials and members of the judiciary. In recent years the Russian authorities have acquired a range of additional legal tools to restrict access to information, carry out surveillance, and censor information online. Access to websites can be blocked based on a blacklist supposedly created to protect children from information “harmful to their health”, or because the Prosecutor General deems them to contain incitements to riot or to attend illegal protests in public places. Numerous Internet resources, including www.Znat.ru and www.Kasparov.ru have been banned on those grounds. The so-called “Yarovaya Package” (2016) was adopted into law despite strong resistance from online legal experts, media enterprises and civil society. The package of laws was justified in the name of combating terrorism and strengthening public security. Telecommunications companies and Internet service providers were obliged to store records of communications metadata and to disclose them on request from various state authorities without the need for a court order. This set of laws granting the state sweeping powers affecting the privacy and free expression rights of Russians were adopted without consultation with media representatives or independent legal experts, and Parliament adopted them with little or no serious discussion. Tough controls have been imposed on the activities of bloggers and the operations of news aggregators and intermediaries. And the attempt to restrict outside influence in the media has been tightened through new restrictions on foreign investment and ownership of media in Russia. The official limit for the foreign ownership share in any media outlet is 20 percent. But media owners say that on top of that limitation they face unprecedented pressures to avoid any level of foreign investment. As a result, several media companies with international backing have gone from the Russian market, reducing the diversity of media titles and making hundreds of media workers unemployed. International investment played a key role in boosting the quality and efficiency of Russian media in the 1990s, and at the time it was greatly welcomed. Foreign expertise and money gave birth to a marked improvement in media management, new technologies, and the quality of reporting. Such outside influences are no longer welcome. Many projects and programs involving international collaboration have been frozen or stopped. Mid- career training, management skills and other initiatives which supported media development and a culture of dialogue have been ended. Media companies and NGOs are constrained from asking for international grants for fear of being labelled “foreign agents” under Russian law for receiving western funding, while few Russian government or private sponsors invest in training independent journalists or media literacy. The few exceptions, such as the Prokhorov Foundation, focus mostly on the cultural sphere and keep away from investing in journalism. Political tensions have exacerbated the damage to freedom of the media and media development in Russia. Sanctions against Russia imposed by the US and EU have also had a drastic negative impact. First, the general economic downturn has led to job cuts, forcing several newspapers to switch to online only outlets, and reducing the resources available for investigations and other expensive content. Second, most of the legal restrictions on media freedom and independent NGOs were in response to the imposition of several waves of sanctions. The consequence has been that most media outlets practise strict self-censorship to avoid court cases or other problems with the authorities. They also do fewer critical investigations and coverage of hot political issues. Those brave enough to continue with those forms of journalism face powerful pressures and often intimidation too. RBK Group, which has TV, newspaper and multimedia platforms, faced a much-publicized court case after reporting that Igor Sechin, a powerful Kremlin figure, was the owner of a luxury yacht and other assets of a state oil company. He demanded 500 million US dollars from the media conglomerate for intrusion into his privacy. The case was closely watched in Russia and abroad, and it ended with RBK not having to pay up. But it was a clear signal to the whole Russian media world not to touch “people in power”. The leading regional TV channel, Tomsk 2, lost its license to broadcast in a case which was nominally about business irregularities, though everybody understood that it was a punishment for its independent reporting stance. Now it is an online-only media. The same fate was meted out to the foremost national independent TV channel, Rain TV, which won a large following by giving space to opposition voices and presenting an alternative to loyal pro-Kremlin outlets. Several of the best regional independent media companies have been pilloried on national TV as “Western agents” and “debtors of the US State Department”. The National Press Council has found that several programs on those “loyal” channels were broadcast at prime time and were full of lies and propaganda, in violation of ethical and professional standards, but such programmers continue to be put out regardless. It is now commonplace for such smear campaigns and outright propaganda on state-run TV stations to target independent media and NGOs, and their leaders, using multiple falsehoods. The Mass Media Defense Centre, Memorial and other human rights groups are regularly labelled as “enemies of the nation”. The steady stream of partisan propaganda on national TV has led much of Russia’s youth to switch off from it altogether. Most educated young Russians now never watch TV, and rarely read newspapers. They only use the Internet and rely on Instagram and Telegram. “Novaya Gazeta”, the leading opposition voice among national media, is currently facing multiple court cases for its reporting. In the past it has taken several cases to the European Court of Human Rights and won. The latest legal attacks have concerned its original reporting of violations of human rights, child marriages, honor killings and killings of LGBT people in Chechnya. In spring 2017 Chechen Muslim leaders declared a “fatwa” against Novaya Gazeta journalists (like the fatwa once directed against Salman Rushdie). Since then several journalists have been forced into hiding. Legal attempts to have the fatwa lifted have so far brought no results. Muslim leaders have refused to retract the call to kill journalists and nobody has been punished. 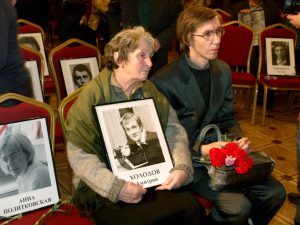 Julia Latynina of Novaya Gazeta and Echo of Moscow won the Politkovskaya award in September 2017 but because of the risks she could not receive the award. She and her family have gone into hiding in Europe after a series of death threats and actual attacks, for which nobody has been punished. The culture of impunity is a heavy and persistent problem in Russia, which often inspires new acts of violence against independent journalists, media and other independent voices. 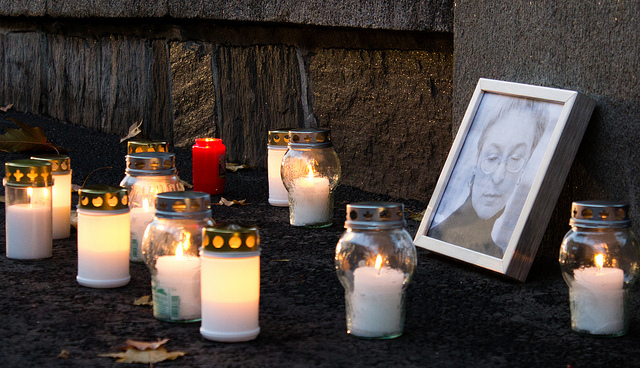 The responsibility for that culture of impunity lies squarely with the Russian authorities. 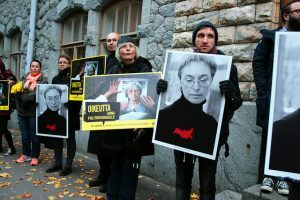 That was clearly set out in Novaya Gazeta’s recent coverage marking 11 years since Anna Politkovskaya’s assassination. The underlying cause is the absence of the political will and determination to investigate the full truth about the murder of Politkovskaya and other tragedies. 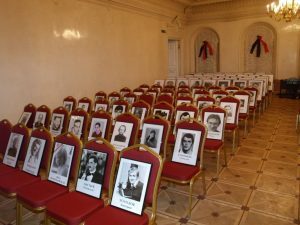 There are now more than 350 names on the list of killed journalists published by the Glasnost Defense Foundation. It gives details of all those who have been killed, disappeared, or died in unexplained circumstances since the 1990s. Most of those cases have not been properly investigated. It is now widely accepted that the culture of impunity in Russia is closely linked to the lack of a strong civil society and professional solidarity among journalists in Russia. The Free Word Association, a newly established organization of journalists, bloggers, translators, writers and script writers prepared the first comprehensive report on violation of rights of journalists, bloggers, artists and writers in Russia in 2016-2017. The report was supported by PEN International and presented at the PEN World Congress in Lviv in September 2017. 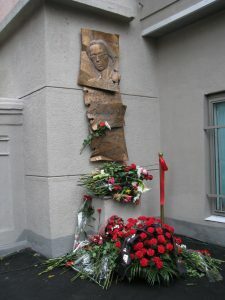 It was based on analysis and data of numerous organizations working on freedom of expression in Russia, including the Glasnost Defense Foundation, Mass Media Defense Centre, Memorial, the Librarians Association and others. The authors identified a new source of threats to freedom of expression (free word). That threat is the so-called “activists ‘initiatives” by groups of nationalists or religious fundamentalists which pretend to represent the “people’s voice”. Those groups disrupt or destroy exhibitions and performances, attack journalists and writers, and incite others to kill journalists. They are regularly allowed to act with impunity as they whip up an atmosphere of fear and uncertainty. Monitoring of their actions shows that they direct their threats and intimidation against women journalists, feminists and opponents of their fundamentalist creed three times more often than men. Galina Arapova, the highly-respected media lawyer, chair of Mass Media Defense Foundation, and board member of Article 19, sees two major elements behind the culture of impunity in Russia. They are “partial justice”, selective implementation of the law (pro-governmental journalists are protected while critical journalists are treated with maximum harshness). She reckons that this could be changed, but only if the journalistic community, together with civil society, raise their voices effectively to demand the rule of law and true justice. Meanwhile, recent announcements of even more extreme measures to crack down on dissent and free speech were made since the presidential election in March 2018 in which Vladimir Putin was re-elected for six years without any credible opponent being able to stand against him and in a media, environment overwhelmingly biased in his favor. International and Russian media alike risk being placed on a list of “foreign agents” for receiving international funding. Amendments to data laws are proposed which could grant special protection to state officials and their family members, making them in effect “untouchable” by critics. After the recent fire tragedy in Kemerovo, where more than 60 people died, prompting protests in many Russian cities, members of parliament suggested introducing new restrictions on the coverage of tragedies to “prevent harmful rumors”. The misuse of legislation and selective justice has become the norm in Russia, accepted by many as a fact of life. Independent journalists and editors regularly face criminal accusations not for what they publish but for alleged common crimes, like extortion or bribery (as in the case of Igor Rudnikov in Kaliningrad), or “extremism” (in the case of bloggers reporting on protests and street actions). Free media and independent journalism face an array of challenges today in Russia. Free journalism is alive but under intense and sometimes murderous pressures. Its future will depend above all on the personal dedication of media professionals, and their solidarity and commitment to exercise media freedom and fight for their rights.